Bellator MMA Lightweight World Champion Will Brooks meets Dave Jansen on April 10 at Bren Events Center in Irvine, Calif.
Bellator MMA Lightweight World Champion “Ill” Will Brooks (15-1) returns to action on April 10, when he faces top contender Dave “The Fugitive” Jansen (20-2) at Bren Events Center in Irvine, Calif on April 10. Both bouts take place on the evening’s main card, which airs live and free on Spike TV at 9 p.m. ET/ 8 p.m. CT, while preliminary bouts stream on Spike.com at 7 p.m. ET. Tickets for “Bellator: Brooks vs. Jansen” go on sale next Friday, Feb. 13 at 10 a.m. PT and are available online at www.ucirvinetickets.com (under the Bren Events Center tab) and through the UC Irvine Ticket Office. “I’m really looking forward to this one,” said Bellator President Scott Coker. “Brooks and Schilling were two huge components to our successful show last November, and I wanted to get them another fight as quickly as possible.” With Will Brooks, you’ve got a phenomenal athlete with a tremendous personality. He is someone who brings it each and every time he gets in the cage. Joe Schilling is one of those incredible strikers who just has danger written all over him. I think our team has really done a great job in finding both of these guys extremely tough opponents in Jansen and Carvalho respectively, and I’m happy that I’ll have one of the best seats in the house..
Additional bouts will be announced shortly. The 28-year-old Brooks looks to make the first defense of the undisputed Bellator MMA Lightweight World Title he earned in November with a thrilling, fourth-round finish of former champ Michael Chandler. Prior to the win, Brooks boasted Bellator MMA’s Interim Lightweight World Title, which he also earned with a victory over Chandler. Overall, Brooks – an American Top Team athlete – is on a seven-fight winning streak and has lost just once in his 16-fight career. Across the cage from him, the 35-year-old Jansen also brings a seven-fight winning streak to the cage. An eight-year veteran of the sport, Jansen earned his shot at the belt with a 2012 tournament victory after registering wins over Marcin Held, Ricardo Tirloni and Magomed Saadulaev. He was scheduled to fight for the title in 2013, but an injury forced him to withdraw from the contest. Once healthy, rather than sit around and wait for a rescheduled title shot, Jansen chose to remain active, scoring an October 2014 win over Rick Hawn. Carvalho is a 28-year-old Brazilian who made an immediate impact in his promotional debut, scoring a first-round TKO win over nine-time Bellator MMA veteran Brian Rogers. Carvalho is quickly establishing himself as one of the most devastating strikers in the world today, notching nine of his 10 career wins by knockout, including five that came in the first round. Carvalho lost his professional debut in 2011 but has since earned 10 straight victories. The 31-year-old Schilling has been fighting professionally since 2006, starting his combat sports career in kickboxing, where he earned both U.S. national and world titles in Muay Thai. While he’s since turned his focus to MMA, Schilling continues to compete in striking events, as well, working his way to GLORY’s Last Man Standing tournament this past June, competing three times in a single evening. Schilling made his Bellator MMA debut in November, scoring a “Knockout of the Year” candidate with his stoppage of noted striker Melvin Manhoef. 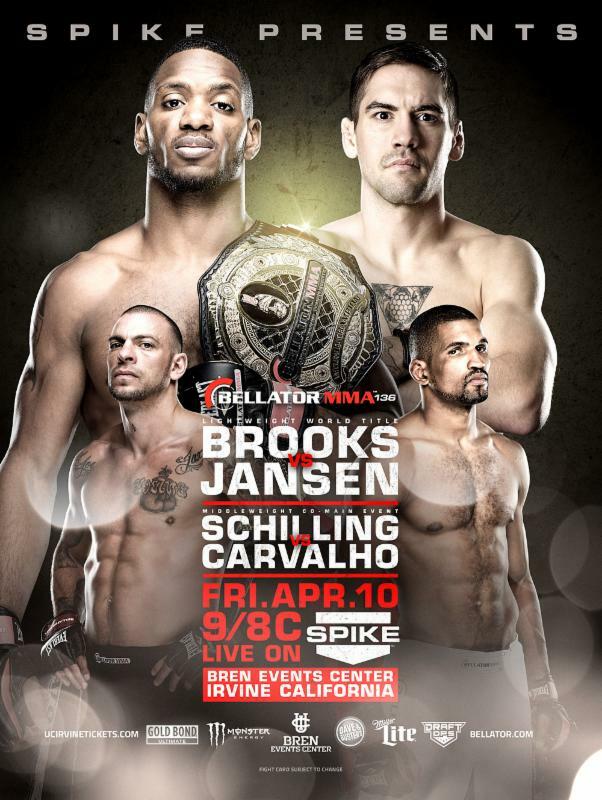 “Bellator: Brooks vs. Jansen” – Friday, April 10, Bren Events Center, Irvine, Calif.